The 'tough-talking' incoming president of the Philippines has to provide the 'corruption hotline' for your complaints against the government. President-elect Rodrigo Duterte wants to implement the 'direct' communication between him and to the Filipino people. 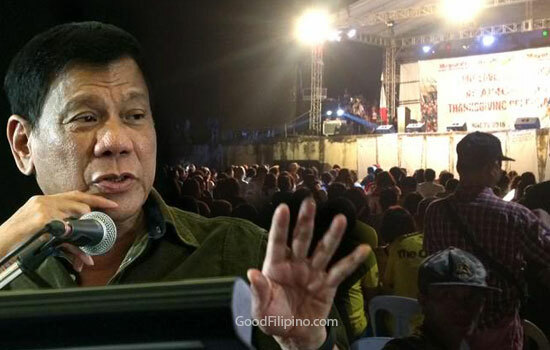 In his thanksgiving party in Cebu city yesterday, Duterte took the stage and give his 42-minute speech to all his solid supporters. He said that the 12 hotline numbers can be used to access him 24/7 and will be manned by persons who will take note of their complaints. Duterte also warned said staff and officials in the Bureau of Internal Revenue (BIR) and the Bureau of Customs (BOC) to stop their corrupt practices. He said, "You better stop it or I will humiliate you." The thanksgiving party has a crowd close to 10,000 and Duterte arrived there at past 10 p.m. after attending a wedding at Shangri-La’s Mactan Resort and Spa in Lapu-Lapu City. The other topics on his quick speech are about his drive against criminality and drugs. He also reminded the bishops that not everything could be solved by praying. According to the news, Duterte didn’t immediately go up the stage. It was already past 11 p.m. when he went up, and started his speech. Duterte left the stage at 11:45 p.m. and boarded his vehicle parked at the back of the stage. Duterte went back to Davao City at 12: 44 a.m., using the same private plane that brought him here, according to the news source. This warning is very serious and this is for all 'corrupt' people inside the government should stop now or you want to be humiliated by the president. Do you like Duterte's corruption hotline numbers? Please took the comment section below and share your thoughts. Comments or suggestions about "Duterte's Corruption Hotline for your complaints against gov't" is important to us, you may share it by using the comment box below.